Gov. Mike DeWine speaks before signing a bill imposing one of the nation’s toughest abortion restrictions, Thursday, April 11, 2019 in Columbus, Ohio. Lt. Governor Jon A. Husted stands at right holding Faye Zaffini, 2, the daughter of his chief of staff. 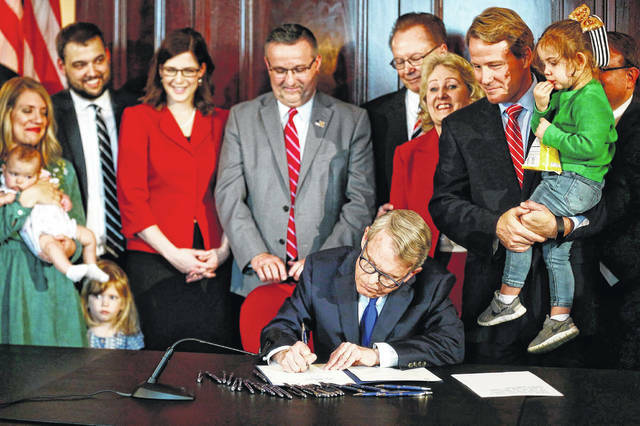 DeWine’s signature makes Ohio the fifth state to ban abortions after the first detectable fetal heartbeat. That can come as early as five or six weeks into pregnancy, before many women know they’re pregnant. Ohio’s closely divided politics had slowed the progress of the bill as it has caught momentum elsewhere , forcing years of debate in the state where the movement originated. Of five previous states that have passed heartbeat bills, three have seen their laws struck down or blocked by the courts, another faces a legal injunction and the fifth is awaiting governor’s action.